Ahead of the Lions tour, we are giving you the chance to get everything off your chest. THE LIONS TOUR to Australia, via Hong Kong, begins in two weeks and will feature six Leinster players and two from Munster [not forgetting Ulster's Tommy Bowe]. We have noticed, ever since TheScore.ie planted our luminous, green flag on the Irish sporting landscape, in 2010, that Munster and Leinster fans love tearing strips off each other in the comments section. In the spirit of rugby brotherhood, and like Dr Marvin Monroe in The Simpsons, we are offering up this Open Thread as the destination to get all your Munster and Leinster grievances off your chest. This open thread will be yours to use and abuse [keeping it above the belt] as long as we remain in Irish waters, circling the Emerald Isle on our trusty fishing vessel to avoid tax. If you ever feel the need to unload — about a forward pass, supporter’s living in the past OR having no history, players [accidentally or intentionally] kicking heads or a TMO try that is ‘no way’ but somehow given — this is your refuge. Ronan O’Gara’s methods as kicking coach turn Jonny Sexton from world-class to bench-warming at St Mary’s? Come here. Joe Schmidt ignores O’Connell, Zebo and O’Mahony and selects 20 Leinster players in his first November Series squad? We’ve got room for you below. We urge to to save the link to this post and direct future, aggrieved fans, Red or Blue, to the forum where all the animosity is laid bare. The Lions Tour is no place for provincial bickering. Email “Open thread: Unload all of your Munster v Leinster grievances here”. 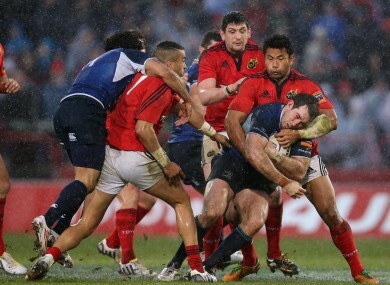 Feedback on “Open thread: Unload all of your Munster v Leinster grievances here”.